Windows 7 allow to control autoplay of various removable media such as dvd, games, movies, usb drives , etc in a very fine way. 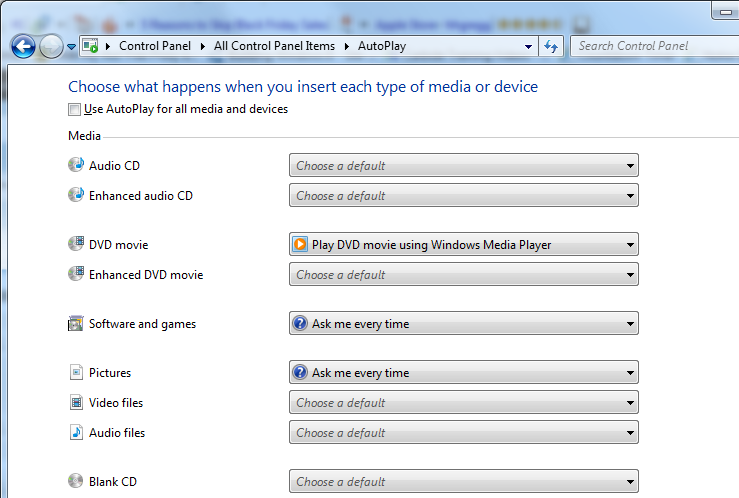 Have a look at the given below control panel option to control autoplay feature in Windows 7. Whether you need to define autoplay option for Blank CD or Pictures CD or Audio Files or anything else, Windows 7 allows fine control over AutoPlay for almost everythin really easily. No need to struggle with Registry or Group Policy Editor, just select how you want the AutoPlay to happen and all is good.